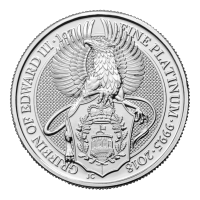 Rückseite Stilisiertes Bild eines Falkens, der das Wappen der Plantagenets hält und die Worte "Falcon of the Plantagenets 2 oz fine Silver 9999 2019". 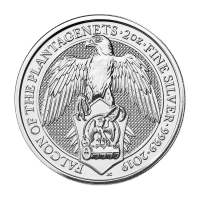 Stilisiertes Bild eines Falkens, der das Wappen der Plantagenets hält und die Worte "Falcon of the Plantagenets 2 oz fine Silver 9999 2019". 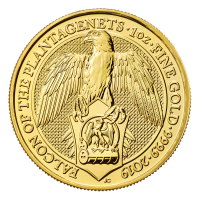 2 oz Silbermünze - Queen's Beasts (Die Tiere der Königin) | Der Falke der Plantagenets - Royal Mint 2019 We’ll offer you the lowest price on the web, when you purchase your 2 oz 2019 Royal Mint Queen’s Beasts Falcon of Plantagenets silver coin from our online store today. This artful creation, designed by Jody Clark, is the latest addition to the royal Mint’s massively successful Queen’s beasts series. The reverse feature is Clark’s rendering of a regal falcon, wings spread and clutching a shield in its talons; this shield reveals a smaller falcon, wings spread, above an open fetterlock. The reverse field displays a light catching, micro-engraved texturing and the border bears details of name, year of release, weight, purity and metal content. The obverse design is an impressively realistic effigy of Elizabeth II, shown in high relief against a backdrop of micro-engraved, dot texturing. Also on the obverse, Elizabeth II’s formal title, along with the unique denominational value of the coin. 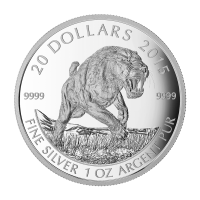 The ten beasts featured on the coin’s in the Queen’s Beasts series stood watch over Elizabeth II’’s inauguration in 1953, as sculptures made by renowned sculpture James Woodford. 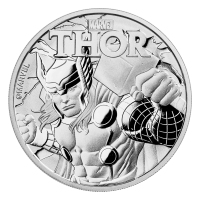 Take this opportunity to celebrate England’s rich royal history and enliven your portfolio with a 2 oz 2019 Royal Mint Queen’s Beasts Falcon of Plantagenets silver coin today.